I've always been curious about the torque output on the 80s/90s E6 and E7 versus their typical competitor engines like the ubiquitous 350/400 Cummins or 3406 Cat. I know the Mack sixes are lower on displacement compared to almost all the other manufacturers (why is this?). But people always talk about how a Mack engine will "pull". Some say their numbers were taken at the rear wheels while their competitors measured power/torque at the flywheel (which I find hard to believe). I'm curious, for example, how a 350 Mack stacks up to a 350 Cummins. I've driven Detroit and Cummins powered trucks but never anything with a Mack engine. Do Mack six cylinder diesels produce more torque? Or just more torque relative to their displacement? When you pull the big hood on a Superliner and see a 350 E6 sitting there it just, honestly, doesn't look all that impressive. Yet, they were very popular/common in that model. There must be a reason why. Another thing I've noticed over the years is that Mack engines sound different than others, at least at idle. Does anyone else fixate on this? Obviously, a two-stroke Detroit sounds like nothing else. But can you discern a 350 Cummins at idle versus a 350 Mack? It's hard to put in words but I've always thought Cummins motors (at idle) sound a little "hollow" and "knocky", if that makes any sense. There's a hollowness to their idle sound. Whereas Macks, to me, sound more "growly"... more "truckish". Maybe a little louder? But different. How would you describe the sounds of Cummins, Cats and Macks... in general? I'm not 100% on this, but I think the Mack torque figures were close to that of cummins, but obviously out of a smaller engine. In the days of mechanical engines, it was easy to tell just by the sound what type of engine any truck had. CAT, Cummins, Mack and of course 2-stroke Detroit each had their own distinctive sound. Nowadays, the Volvo/Mack is the only one I can tell just by the sound. My opinion was that the old E6 / E7 Mechanical 300s were just a very solid engine used for the job they did. they were not a powerhouse for over the road use but the little 676 cube 6cyl would hold its own against engines of 855 cube inch. A 300 mack would run with a 350 cummins. A 350 mack would run with a 400 cummins. The macks had slight torque advantage even with a smaller bore/cube engine. Gearing also has alot to do with it as Mack had widely used double reduction diffs and direct final drive transmissions. Macks could put more HP/TQ to the wheels with their common gearing in use with Macks own drive train. That being said the old saying "There is no replacement for displacement" still holds true. In my opinion the cummins would pull long hills better. They had the displacement advantage to hold the Hp where the Macks would start to struggle and louse speed faster. Also I believe the E9 didn't catch on as well as it could have because of less than stellar performance of the earlier Mack V8's. Also V-8's in general are a little shy on torque and rely on HP(RPM) to get the job done. If Mack had made an 900 plus cubic inch six cylinder engine using the Maxidyne principal things may have turned out differently. They would have been well suited to todays 1000-1500 operating range. Also I believe the E 9 didn't catch on as well as it could have because of less than stellar performance of the earlier Mack V8's. Also V-8's in general are a little shy on torque and rely on HP(RPM) to get the job done. If Mack had made an 900 plus cubic inch six cylinder engine using the Maxidyne principal things may have turned out differently. They would have been well suited to todays 1000-1500 operating range. Great chart, Timmyb. Just what I was looking for. Does your chart include the E7400 (did it get cut off)? Or any other makes of engine to compare to? Very interesting that the E6 350 and the E7 350 appear to have identical torque ratings. Although it appears that there was also a version with a higher rating, just cut off at the bottom of the chart. Where is the line between a "small bore" and a "big bore" engine? Is the E7 still considered a small bore? That big six looked like it was ready to go. I wonder who killed that (Renault)? I wonder if that was in the same time frame as the intro of the E-7. I know the E-7 got off to a rocky start(pistons rings) as I recall. This was about the same time Mack went to South Carolina. Was the E-7 a Renault design motor as some have suggested. That might help explain the big six never went into production. Too bad if so. I attribute some of the cummins hollow/knocky sound at idle to their weird single piston air compressor. Click away my friend. Also if your handy with a google machine you can google dw clutch chart and put cummins, cat, Detroit, Mack, international and they will have a chart for you. I forgot about the "Big 6" That could have done wonders if it was as good as it looked. So do all E6s have the same bottom end? And all E7s? It's just a matter of pump and turbo differences? Interesting that E6 torque ratings range from 750 to 1277. E7 torque ratings range from 1083 to 1660. Quite a wide range on the same bottom ends, if that's the case. After seeing these numbers I'm wondering how I ever pulled 140,000 pounds up and down constant 8,10 and 12% hills here for all those years, with my little E6 350. We even did a test on a 300 mile trip. And the E6 350 took less than 30 minutes more compared to a C15 475/1850. This one is an 88, 4 valve and the odo has rolled over zero twice. The 11 liter (11.01 liter/672 cu.in.) Mack E6 and 12-liter (11.9 liter/728 cu.in.) E7 were able to meet 95 percent of customer applications, offering impressive power, torque and class-leading fuel economy combined with light weight and lower operating costs. For those needing a larger powerplant, we offered the legendary E9 V-8, rather than a large six like Cummins. Fast forward to year 2017, owing to new technologies, we're able to "reliably" get more horsepower out of 11 liters than we were able to in 1985 when we launched the superb E6 4V. The four valve head E6-350 with an American Bosch pump remains one of my favorite engines. I love selling V-8s. And our customers love driving them. But for most operators, a 420hp 11-liter will make their accountants smile the most, the same way the accountants at Chemical Leamon, Matlack and Overnite used to smile. And I bet you used less fuel than the CAT every day. Sometimes faster doesn't win the race. The 11 liter (11.01 liter/672 cu.in.) Mack E6 and 12-liter (11.9 liter/728 cu.in.) E7 were able to meet 95 percent of customer applications, offering impressive power and performance combined with light weight and lower cost. KS, I appreciate your historical viewpoint on Mack engineering. I can't wait to put my MH 4v-350 to work this year. 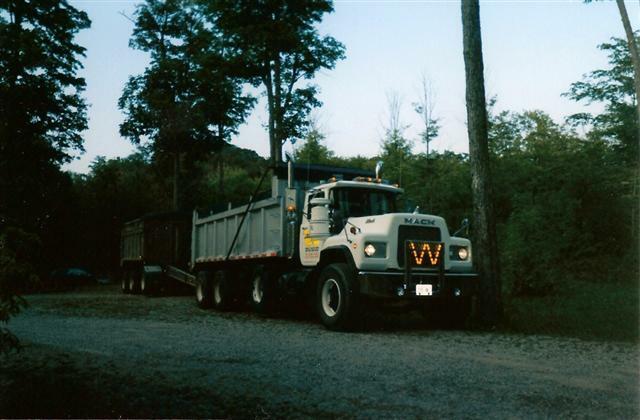 An MH Ultra-Liner powered by an E6-350 (4VH) ties with the Value-Liner as being my favorite Mack trucks of all time. Back in the mid 90's my dad ran a 76 Kenworth with an 8v92 detroit. He upgraded to a 91 Mack with an e7 400. He saved $700 a week in fuel. Truck repayments were $2000 a month. It was a free truck! Would you recommend an E9 as an engine in a hobby truck? One that just hauled light loads or ran empty frequently? Like most folks, I think a V8 is cool but I constantly hear horror stories about how scarce parts are getting to be. If something went wrong, sounds like I'd be sunk. I've never been around an E9 but wouldn't want to get a motor that is so obsolete that parts are unobtainable. Sounds like that's not such a concern with the 6 cylinders. Also, what kind of MPG difference would there be between a small-bore 6 and a V8 under these light-load conditions? Based on what you said, I'd recommend an E6. Just about any engine could do what your asking of it, including an e9 but it wouldn't be my first recommendation. The start of the E7 was a rough time for Mack due to the move to SC and trying to go non union. As I understand many unions in supplier shops purposely sabotaged Mack parts. The Big in line 6 that is displayed at the museum was something from the 70's I thought? And I remember one of the folks there telling me that weight, cost, power, fuel consumption, etc it was just not going to work for Mack. I remember seeing a picture of a truck in Canada that was running the test motor. My E6-350 did a kickass job this week. For power and MPG I would put it up against my old E-tech 427 any day. Whereas Macks, to me, sound more "growly"... more "truckish". Maybe a little louder? But different. How would you describe the sounds of Cummins, Cats and Macks... in general? As a kid I used to be fond of being able to tell different engines based on their sounds from even far away. Even some trucks with the same engine types had distinct sounds due to their individual exhausts etc. which allowed me to identify the owner.